I have known of Michael Lang through a friend for about five years. When it came time to renovate our cabin, there was no question who I would turn to. I have worked with Michael on our cabin “redo” for the last two and a half years. This cabin is a “work in progress”, correcting past deficiencies and turning it into a retreat we can’t wait to get back to. 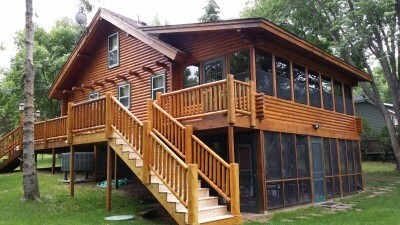 Michael and his crew completed a main-level remodel of our cabin Spring/Summer 2013. The project morphed into much more than ever expected; the unexpected became the expected. Michael kept me informed every step of the way. He presented options to address the issues as they arose. His advice was knowledgeable and thorough. Michael was always willing to listen to my ideas, incorporate what he could and make sure I understood the reasons if what I envisioned wasn’t possible. The quality of work done by Michael and crew is unsurpassed. The attention to detail is amazing. No corners are cut; nothing is overlooked. The end result for us is a beautiful cabin with a functional floor plan. My wife and I marvel at how everything came together. Michael’s foreman Brian has tremendous carpentry skills. His ability to scribe wood products is truly masterful, whether it is flooring, walls or trim. He is willing to undertake challenging concepts, making dreams reality. Brian is easy to work with and genuinely cares that you are pleased with the final outcome. It is difficult to pinpoint what I like best about Michael, his crew and their work. Everything they undertook was accomplished; leaving me with a cabin I am proud of and can’t wait to show off to family and friends. They are conscientious and easy to work with. I don’t hesitate to recommend Paragon Homes by Michael Lang, and personally look forward to working with them in the future.